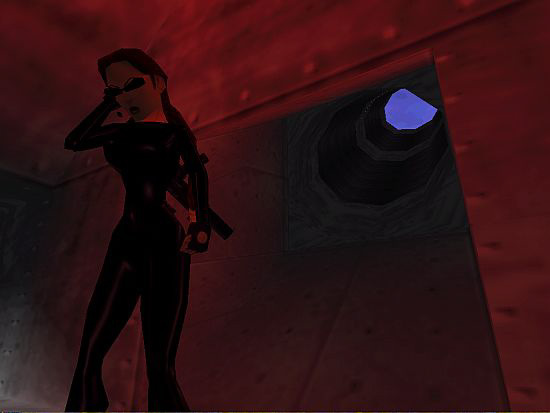 Do you remember the cutscenes in which Lara's talking to Zip in TR5 VCI levels, using her headset? Well, you can create similar situations in NGLE, if you want. The player makes Lara move but then she stops suddenly, automatically. It's because she can hear something in her headset, obviously: she raises her right hand to the set so that she will hear better. The conversation happens. Then Lara lowers her hand and the player can control her again. - A proper LARA_SKIN, i.e. in which the headset is on Lara's head. (I recommend one of Po Yu's outfits, from TRSearch.) Put it (and its accessories: LARA_SKIN_JOINTS etc.) into your WAD. - An audio file in which the conversation is recorded with an actress (Lara) and an actor (Zip). (It's not necessary if you achieve the conversation by texts. - See more below.) Put it into your audio folder. Use a usual audio ID as a name. Obviously, each conversation will happen only once. That's why the trigger must be 'One Shot' so that Lara can't start that conversation again. You have to press 9 and 10 buttons in the OCB panel of the first camera of the sequence so that the player won't be able to abort the sequence using the Look key, and Lara won't be able to move during the sequence. When Lara activates Organizer#1 by that trigger, then Organizer activates TriggerGroup#1 (see '0, 1') and TriggerGroup#2 (see '0, 2') at once. (Lara's most important animation is Animation103, when she's standing and still. It means many other animations start or should start from Animation103, including Animation467. I.e. 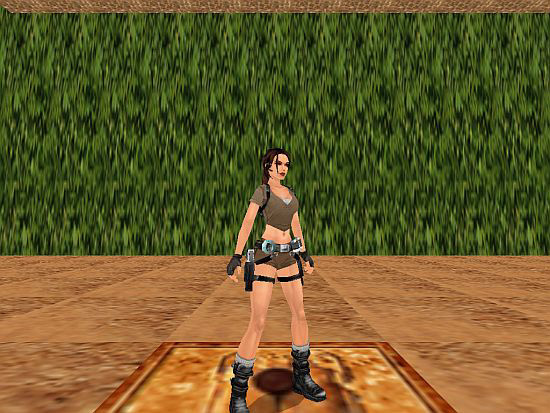 at its very first frame, Lara's standing and still in Animation467. So, if Lara just performs a non-standing and/or non-still animation just when the game forces her to perform Animation467, then it will be more or less ugly. - That's why the Organizer gives Lara some time to finish her actual movement, i.e. to reach the standing-still position at the end of the actual movement, before starting Animation467. Animation467 shows Lara's raising her hand to the headset. The next animation is Animation468 automatically (see Next Animation of Animation467 in WADMerger Animation Editor). It's a loop animation where we can see Lara holding her hand to the headset. Animation469 is a short animation: Lara lowers her hand, and then she's just standing and still. The cutscene's ended - and you can also stop the flyby sequence now. 1. The setup is flexible at some points, so you can change it, if you want. For example, you can use other number buttons for the sequence, not only 9 and 10. For example, use 0 so the sequence won't start from Lara's chase-camera, but will start directly from its first camera. 2. Be careful with the situations in which Lara can't get into a good position for starting Animation467. For example: she jumps when activates Organizer then lands. But on a slope, that's why she starts sliding. So 3 seconds after she's started the flyby sequence she's not standing and still but standing and sliding. 3. The setup I've introduced you works on only one conversation. - Another placed One Shot trigger to start another Organizer. - A link to TriggerGroup#1 in the new Organizer, to remove the weapons. - Another flyby sequence and another TriggerGroup in the new Organizer to start this new sequence. - Another audio file and another TriggerGroup in the new Organizer to start this new audio. - Another $2000, 80, $D3 trigger to force Animation467, in the TriggerGroup of the new audio file. - A link to TriggerGroup#4 in the new Organizer, to start Animation469. ; <&> : 4: ZIP\nHey, Lara! It uses PARAM_PRINT_TEXT#1 to print the contents of ExtraNG#4 entry ('ZIP\nHey, Lara!') on the screen. (Where '\n' means 'I hit ENTER'.) - So Zip starts the conversation now, with a salute. PARAM_PRINT_TEXT#1 means the text will be written in '300, 300' position, with white fonts (see: CL_WHITE), for 3 seconds. ; <&> : 5: LARA\nHey, Zip! What's the matter? It also uses PARAM_PRINT_TEXT#1 to print the contents of ExtraNG#5 entry ('LARA\nHey, Zip! What's the matter?') on the screen. - So Lara salutes back and asks why Zip called her. 1. The entry of CUST_TEXT_ON_FLY_SCREEN is needed or else the list won't be printed on the screen of a flyby sequence! 2. Of course, this is just an example, so you can form the fonts and print the texts in other ways, if you want. 3. This 'text-setup' will also work only on one conversation. Do another setup for another 'text-conversation' - similar way as I said at the 'audio-setup' above. - the changes between Animation467 and 468 is automatic (i.e. controlled by only the Next Animation field) and between Animation468 and 469 is only controlled by a trigger. But only if we are talking about the animations of LARA object. I mean, for example, 'drawing a weapon' is not an animation of LARA object, i.e. it has nothing to do with the interruption/Next Animation management of LARA object. So, player is able to make Lara draw weapons if the headset-animations are just being performed. But, as I said above, these animations are ugly without empty hands, of course. So we need that disabling Button 10 not only to start Animation467 from a standing-still position but to disable non-LARA movements (drawing weapons, igniting flares etc.) when the flyby camera sequence is just working (during the headset-animations). But what if you want the sequence to be ended before the headset-animations end? (So now the ending part of the cutscene uses another type camera, e.g. Lara's chase-camera.) In this case, Lara will be able to draw weapons etc. during those animations, after the end of sequence, because Button 10 is not valid now. So GlobalTrigger#1 disables all the key commands when Lara's performing Animation468 or 469 and enables them again, as the animations has just ended - and now it doesn't matter if the flyby sequence is just working or not. 1. GlobalTrigger#1 (with TriggerGroup#6, 7 and 8 together) always works with any setup: one/more audio/text/combined setup(s). 2. I didn't want to make the things more complicated, that's why I disabled all the keys. But you need to disable only the keys that are usable to perform non-LARA object animations when Lara's performing Animation468 or 469. 3. I don't think the flyby ends before starting Animation468. That's why Animation467 is not calculated now. 4. Try to make the setup more perfect, if you want. I mean I realized if I extract the weapons exactly at the moment (!) when the Organizer starts the whole procedure, then there will be weapons in Lara's hand during using the headset. As I said above, the setup is flexible - so, for example, we can use other forced animations, not only 467, 468 and 469. 2. Some forced animations won't work properly, so you need some tricks to make them work properly. See for example that running animation. It needs the player to press the up arrow continuously. But we can't use an animation forced if that needs the intervention (i.e. key-pushing) of the player - that's why this running animation fails if we want to force it. But there's a solution if we do more than using an animation-forcing FLIPEFFECT trigger. So, we also force Lara to have a neutral State ID (let's say, State69), when we force her to run. (Or, copy-paste the running animation into a new animation slot, with StateID69, and that animation is what you will force.) - That StateID doesn't need and doesn't accept any intervention. That's what will happen with StateID69: Lara performs the 21 frames long forced running animation one time. 3. As I said above: in a cutscene, animations have automatic connections between each other, without the intervention of the player - at most, some triggers also control the operation. - define the proper trigger to abort the forced animation or to force another animation (see above, how). 4. Don't forget to disable keys for any forced animations you force after the flyby sequence stopped.